In our workshops we combine all the benefits of yoga and nutritious food to help you build a foundation of holistic health and well-being for you and your family. Join Miriam for an interactive workshop suitable both for beginners and more-seasoned yoga practitioners. Sun Salutations (Surya Namaskar) are a foundational element of Hatha Yoga. An ancient ritual created to express devotion to the sun, Sun Salutations practised daily are a powerful way to develop a yoga self-practice and start the day in a healthy, positive way. To understand their benefits, we must know how Sun Salutations affect the physical, breath and energy bodies. As well as benefiting the body, Sun Salutations activate our inner solar (dynamic, yang) energy and remind us that we are deeply connected to and part of the natural world. Understanding Surya Namaskar means you can take your yoga practice with you wherever you go. Date: March 09th 2019 from 2.00 to 4.30 p.m. Registration: namaste@yogainabag.com or using our schedule. Cleanse your body, mind and soul from the inside out. With breath, movement, relaxation and healthy food you detox and strengthen your whole system. Before the yoga practice you spoil your cells with fresh juice and smoothies! Please wear comfortable cloths. Mats and props are available at the studio. This course is taught in english. Date: Sunday, 10th of March 2019 from 1.30 to 4.00 p.m. Registration: namaste@yogainabag.com. The number of participants is limited. On request, we design your personal yoga retreat! Minimum 5 participants. If you are interested in a private retreat send us an email to namastegyogainabag.com. We are happy to send you a customised offer. Are you ready for the 4-week FIND YOUR FLOW Challenge? Find a new flow and embrace the change. Get all the information about the FIND YOUR FLOW Challenge here. Are you new to yoga and would like to learn more about yoga? Have you already practiced yoga but haven’t been to a class for a while? 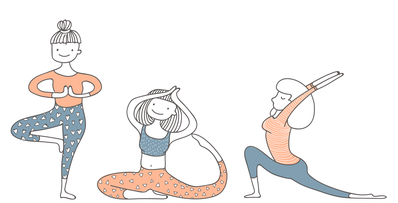 Or do you want to refine your yoga practice? Then our yoga basics workshop is perfect for you! We focus on a healthy alignment of the yoga poses, learn about basic breathing techniques and the fundamentals of a yoga sequence. You can ask all your questions, develop your yoga practice and meet new friends. We close the workshop with a deep yoga nidra relaxation and spoil ourselves with a fresh juice or smoothie. Wear comfortable cloths. Mats and props are available. This workshop is held in english and german. Participants get their first 10 pass for 230 CHF (instead of 270 CHF).